308-310 Broadway is a brand new - fully renovated luxury modern duplex in the heart of Cambridge, MA. The Broadway Collection is an invaluable opportunity to purchase a one-of-a-kind asset, located in one of the highest barrier to entry markets within the city of Cambridge. This property is in the early stages of development with a completion date slated for June 2019. The Broadway Collection is currently being marketed exclusively thru Juwai Limited for a limited time in the hopes of attracting a discerning overseas investor searching for a trophy asset just steps from Harvard University, MIT and the most innovative square mile on the planet - Kendall Square. 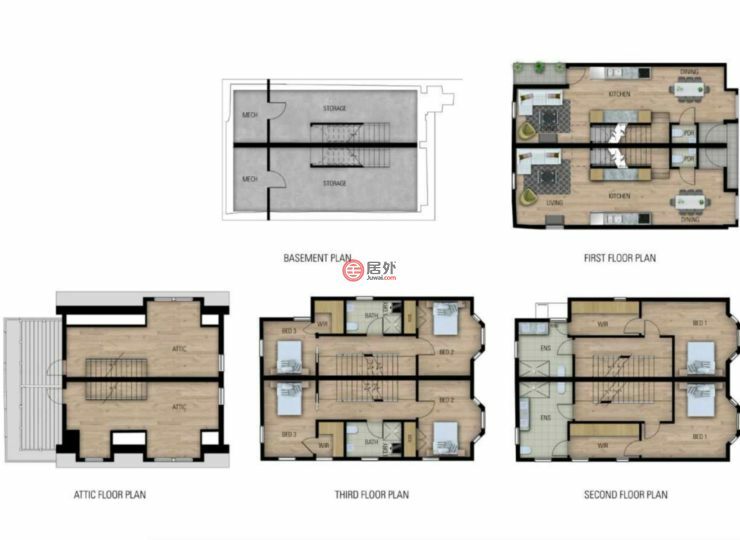 Each unit offers close to 2000 sf of living space made up of 4 bedrooms + 2.5 bathrooms plus a fully finished basement. Both units feature a living room with fireplace, high ceilings and gourmet kitchen with breakfast area and top-of-the-line appliances to satisfy the most discriminating Chef. The Broadway collection is the perfect investment with endless options for the overseas investor looking to diversify investments, support foreign education for children while living in one and renting the other, maximize life style and inter-generational wealth building all while investing in one of the hottest real estate / rental markets in North America. The Broadway collection is being sold as one property in a section of Cambridge that is demanding an average sale price of $900.00 US per sf. for newly renovated construction. Individual sales will be addressed on a case-by-case scenario.